One of my mum’s dishes this shows how worthwhile it is to try less-common cuts. It’s a wonderful supper and provides great leftovers for lots of dishes. Soak the hocks for 24 hours, changing the water twice. To make the sauce, heat the milk with the onion, parsley stalks, peppercorns and bay. Bring to the boil, remove from the heat and infuse for 15 minutes. Strain. Melt the butter in a heavy saucepan and add the flour. Stir over low heat for a minute. Slowly add the infused milk, stirring to incorporate before you add more. Return to the heat. Bring to the boil, stirring, then simmer for 4 minutes. Season, add the cream, finely chopped parsley leaves and lemon juice. Taste; you may want mustard, more lemon juice or extra seasoning. Cover to keep warm. Core and shred the cabbage. Melt the butter in a heavy saucepan, add the cabbage, season and add 2 tbsp water. Reduce the heat to low, cover and cook for 4 minutes, shaking. Stir, so the butter coats the cabbage. Cover, but don’t let it sit for too long. Remove and discard the fat from the hocks and break the meat into large pieces. 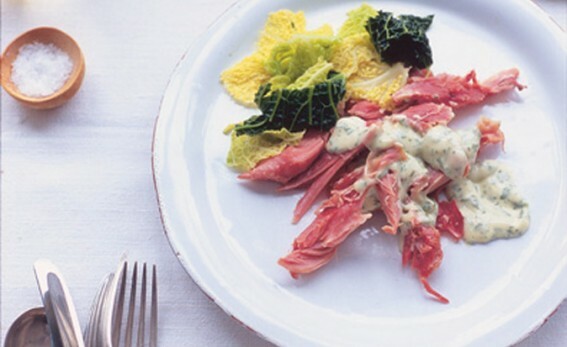 Serve the ham with the parsley sauce, and the cabbage. It’s also great served with boiled potatoes.